In more traditional formats of theatre production there exists a distinct separation between a produced spectacle and the spectators witnessing it. The SummerWorks festival is very much an event that seeks to rattle the confining definitions we traditionally place upon the medium. Unintentionally Depressing Children’s Tales serves as a prime example of how to accomplish this in a most accessible manner. The title of this production is misleading, albeit in a very functional way. One assumes the production to have an ironic and/or dark twist (and it does), but the tales themselves are markedly not for children, despite their being told with child-like whimsy. Attendees to this production are ushered into a space the size of a modestly-sized living room with the floor covered in blankets and pillows and the walls and ceiling-area strewn with blankets of various materials and patterns. 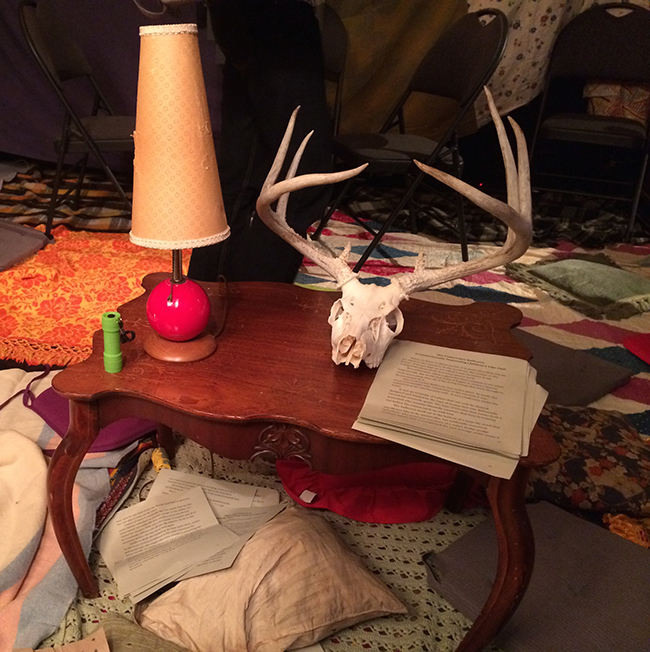 Occupying the middle of the space is diminutive antique side-table adorned with typed-on papers, a lamp, and a deer-skull. The lights will dim and from this center a speaker reads from the papers, narrating a story depicted on the pale-colored sheets through the use of intricately assembled shadow puppetry; the process repeats a few times, with a new narrator and story in each instance. The stories themselves are simultaneously dark and delightful. More or less unrelated in plot, but a common element between the three tales could arguably be protagonists suddenly finding themselves upon an opportunity to do good unto others as they strive to get further in touch with their own selves. How each of these protagonists reacts to such opportunity adds to the unique character each short brings to the table. The stories are beautiful, and cute even, as they spin tales that will very likely make you giggle multiple times. But despite that, there is sadness in all these short stories. There are those that may hesitate at the idea of attending a theatre festival curated with productions of unconventional modes of presentation at its heart, but Unintentionally Depressing Children’s Tales carries a enough of a wonderful balance of emotion, light-heartedness, sadness, beauty and outside-the-box production design to make for a truly accessibly show that will make you glad you got to experience something so unique. Dora-nominated playwright Erin Fleck has accomplished something admirably here with her well-balanced dark comedy. Unintentionally Depressing Children’s Tales continues to play at SummerWorks until August 17th. Check out the official schedule for your chance to see it.